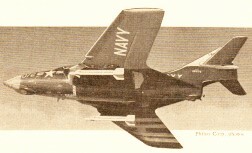 It was 1958, over the Taiwan Strait, when the first Sidewinder air-to-air missile flew up the tailpipe of a MIG-17 Fresco after being launched by an F-104 Starfighter. The age of offensive infrared (IR) warfare had begun. It is amazing that the detection and guidance system for the Sidewinder was built largely from discrete components, without the advantage of large scale integration. IR night vision devices were actually used by the military as early as WWII with the renowned Snooperscope (handheld) and the Sniperscope (mounted to a carbine rifle). Both required an infrared light source to illuminate the target. Today's night vision goggles and scopes are sensitive enough to be totally passive. 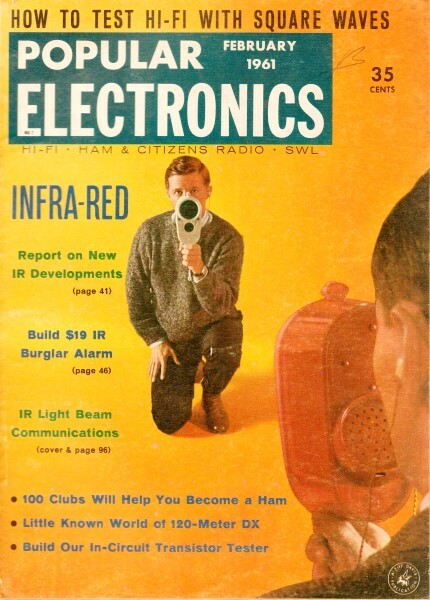 This "Infrared" article from the February 1961 Popular Electronics talks about early developments in infrared technology. Corny-looking prototypes of IR wireless phones are shown, but obviously that concept never took off. There is a cool photo of a 15" diameter solid germanium disc lens that has been polished for use as an IR missile detection system "picture window." See 1963 Time magazine article on the Snooperscope. During the Quemoy crisis two years ago, a new weapon made the headlines. Known as the "Sidewinder," the instrument was the first guided missile to destroy enemy aircraft in actual combat. The Chinese Nationalists exploded scores of Red MIG-17 jets in mid-air with the aid of this lethal device. Interestingly enough, the Sidewinder missile is named after the desert rattlesnake - both strike by homing in on the infrared radiations which their targets emit. The hot exhaust of an enemy jet becomes the target for this heat-seeking missile, which zooms into the tailpipe and destroys the aircraft in a fiery explosion. What Is Infrared? Actually an electromagnetic radiation much like radio or light waves, infrared is produced to some extent by every object above absolute zero (-237° C). And the hotter an object becomes, the more infrared is emitted - the sun, for example, is an excellent infrared radiator. 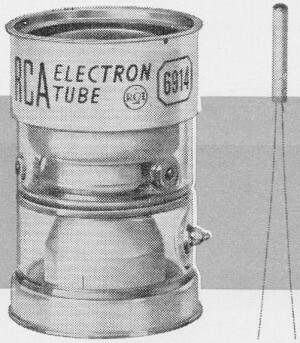 Image tube (left) converts invisible infrared into visible light; the World War II "snooperscope." which enabled troops to see in the dark, employed such a detector. Modern Single-crystal Infrared detector (right) is a byproduct of transistor development unit; produces output voltage in proportion to amount of infrared radiation failing upon it. Both devices are products of Radio Corporation of America (RCA). The discovery of infrared took place over 160 years ago. In the year 1800, William Herschel placed a number of thermometers along the full length of a rainbow-like spectrum of the sun's light which had been dispersed by a glass prism. As he expected, the thermometers were heated by this visible light - from the violet at one end of the spectrum to the red at the other. But there was one thing Herschel didn't expect. The thermometers were also heated at the end of the spectrum beyond the visible red region, indicating that some form of energy was also present there! Since this radiation was below the visible red region, he dubbed it "infrared." For over a century, Hershel's discovery remained nothing more than a scientific curiosity. Then, in the 1920's and 1930's, several laboratory instruments were developed which used infrared to identify unknown materials and analyze chemical compounds. And World War II brought the amazing "snooperscope" which enabled our troops to literally see in the dark. Types of Systems. Infrared systems are classified into two groups. In the "active" system, the target is illuminated by an infrared spotlight; the snooperscope is an example of a device which uses this system. The second or "passive" system detects the infrared energy emitted by the target itself, as does the Sidewinder missile. As might be expected, the passive system requires a very sensitive detector, since the amount of infrared which objects emit is often extremely small. The basic instrument used for measuring infrared radiation is the radiometer. Acting somewhat like the more common photocell, the radiometer collects radiation from a narrow field and converts it into electrical energy which can then be read on a meter or recorded on a chart. Radiometers are used to monitor temperatures remotely with a very high degree of accuracy. Applications. Infrared has been applied to a wide variety of guided missiles, with air-to-air types-such as the Sidewinder - the most successful. Another military application is in aircraft gunfire control. Fire-control systems using visual sights are naturally limited to daytime operation, but infrared equipment extends the operation of such systems into total darkness. Infrared band, sandwiched between visible light and microwave regions, comprises wavelengths from 0.75 to approximately 1000 microns. Still other military applications include airborne early-warning systems, ballistic-missile detection systems, "passive" viewing systems for watching troop movements at night, and infrared communications systems. The "Midas" satellites, for example, will have infrared "eyes" to detect the white-hot exhaust of missiles as they are launched from enemy territory. Many commercial applications of infrared stem from one fact: as infrared light is passed through a chemical compound, certain wavelengths are absorbed and do not pass through. These wavelengths or groups of wavelengths are known as absorption bands. And because the molecules of every substance have a different infrared absorption band, these bands provide a means of identifying molecules in much the same way that a set of fingerprints can identify a particular human being. The infrared spectrophotometer, for example, is an instrument which analyzes compounds and gases. It automatically measures the changes in wavelength of the infrared light passing through a sample and records the resultant absorption bands on a chart. Infrared finds dozens of uses in industry. Among them: analyzing fertilizers, insecticides, and soils in agriculture; complex propellant mixtures and exhaust gases in aircraft and missiles; molecular structure of enzymes and amino acids in biochemistry; essential oils and mixtures in cosmetics; compounds in pharmaceutics. Fire detection is also becoming an important application for infrared. Airlines are now using infrared fire-detection devices aboard their planes, and railroads call on infrared to detect "hot" boxes from fixed positions - even though the trains are moving by at high speeds! Some day, a greater degree of protection from forest fires may be provided through the use of small, battery-operated infrared devices. Wireless telephone - the "Infraphone" - sends conversations hundreds of feet over invisible infrared beam. Produced by Infrared Industries, it is fully transistorized and operates on flashlight batteries. It' available from most major radio supply houses. Place in the Spectrum. All of the advanced military systems now in use, as well as many of the commercial applications, were made possible by new developments in detectors and optics since World War II. Before taking a closer look at infrared detectors, let's see just how infrared fits into the whole of the electromagnetic spectrum. The infrared frequency band, which is located between visible light and radar, ranges from approximately 1 million to 500 million megacycles; the corresponding wavelengths are 1000 to 0.75 microns. (The micron - actually one millionth of a meter - is the unit commonly used for measuring wavelengths in infrared work). In some of its characteristics, infrared resembles visible light - for example, lenses and parabolic mirrors are used to collect and focus infrared energy on a detector. However, it also behaves somewhat like radio or radar waves: it will go right through materials such as germanium and silicon, both of which are impervious to visible light! Traffic detector - the "Traf­fitrol" - uses infrared beam to detect and count vehicles traveling at speeds up to 80 miles per hour. Highly accurate and virtually foolproof, the device is among the first to apply infrared principles to traffic problems. The "Traffitrol" is manufactured by the Heiland Division of Minneapolis-Honeywell. Infrared "picture window" produced by scientists at Hughes Aircraft is solid germanium casting 15" in diameter and 1/2" thick. Optically ground and polished, it is opaque to ordinary light but refracts infrared rays much as a glass lens collects and focuses rays from visible part of spectrum. Used in missile detection systems, the casting is made from 9 1/2 pounds of germanium, and is valued at approximately six thousand dollars. Infrared Detectors. One type of infrared detector, the image tube, operates only in the near-infrared region. 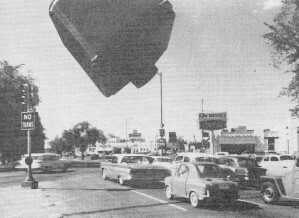 The object to be viewed is irradiated with an infrared spotlight, a device much like an ordinary spotlight, except that it makes use of a filter which lets only the infrared pass. The infrared is reflected from the object and strikes a sensitive film in the image tube. Since this film is photoemissive, it emits electrons when excited by the infrared light. The electrons are emitted from the back side of the film into the vacuum within the image tube and electrostatically focused on a phosphor viewing screen. Thus, the image tube effectively converts the invisible infrared to visible light and enables the viewer to "see" in total darkness. Infrared detectors, other than the photoemissive type, fall into one of three groups - thermal radiation detectors, film-type infrared photoconductors, and single-crystal infrared detectors. Since they are detectors, all convert infrared radiations into electrical signals. But each works differently and therefore has special characteristics all its own. The thermal radiation detectors make use of the heating effects of infrared. There are two types: one is the thermoelectric detector which operates on the thermocouple principle. It consists of two dissimilar metals which generate voltage at the junction as the temperature of the junction changes. Naturally, the junction temperature is proportional to the amount of radiation hitting it. The second type of thermal detector is the bolometer. It consists of a thin metal or semiconductor strip. As the temperature of the strip changes, so does the resistance. And if voltage is applied across the bolometric strip, the current flowing through it will vary as its resistance changes. Photoconductive detectors are comprised of a thin film (about 1 micron thick) deposited on a thin sheet of insulating material such as glass. For their operation, they rely on the photoconductive effects of certain semiconductor compounds. The radiation changes the conductivity of the material in much the same manner that base bias controls current flow in a transistor. This effect can be demonstrated by connecting a bias battery and a sensitive current meter in series with the detector. As radiation falls upon the detector, current will flow. And by replacing the meter with a load resistor, a signal will be developed across it in proportion to the amount of radiation. 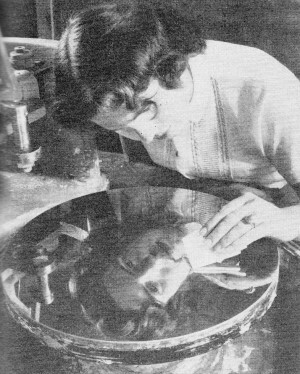 Single-crystal infrared detectors were made possible largely by the invention and development of the transistor. In this type of detector, a semiconductor crystal is used, generally comprised of either germanium or silicon. The material is processed in such a way as to make it photovoltaic, which means that it generates a small d.c. voltage proportional to the amount of radiation falling on it. In all of these detectors, the signal voltages produced are very small. As a result, special low-noise amplifiers are required to bring the signal up to more usable levels. Tomorrow's Promise. As knowledge of infrared and its amazing properties increases, so, too, will its uses. A new traffic-control detector, for example, can detect and count cars traveling at speeds up to 80 miles an hour. Another recent development - a solid casting of germanium, 15 inches in diameter - expands the viewing range of infrared missile detection systems enormously (scientists have termed it comparable to "replacing a porthole with a picture window!") Even infrared detectors have reached all but unbelievable levels of sensitivity. One recent model, already on the market, is so sensitive that it can detect a cigarette burning 500 miles away! Fantastic? To be sure, but this is the fantastic, invisible world of infrared. What still more wonderful developments in this invisible world will tomorrow bring?